El Zonte has an excellent beach for surfing, and becomes a stage for national and international events of this spectacular sport. This beach is known for its bohemian atmosphere. 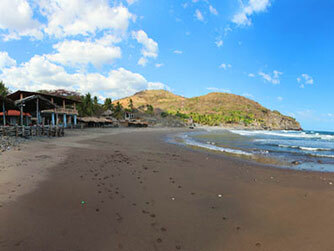 It has rocky areas with beautiful scenery and gentle surf for the family. Playa El Zonte offers an extensive range of restaurants, dining and bar areas to meet the tastes from the simplest to the most sophisticated tastes. In the small village you will find lodgings and hotels for backpackers mostly, where you will find the comfort you need. El Zonte enjoys having variety of daytime and evening activities such as parties, batucadas, and exclusive sporting events for surfing at national and international level. The main activity in Playa El Zonte is surfing. Here you find the right equipment and you can get personalized surf lessons at affordable prices, classes available in English. 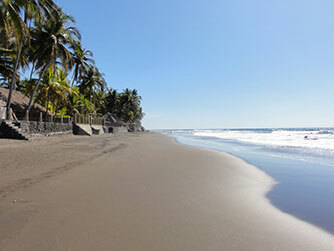 By car: El Zonte is located at kilometer 53 of the highway Litoral, La Libertad area. By bus: You must take Route 192 which has its way from the city of La Libertad to the beach La Perla. Ask the driver to indicate the stop "El Zonte".